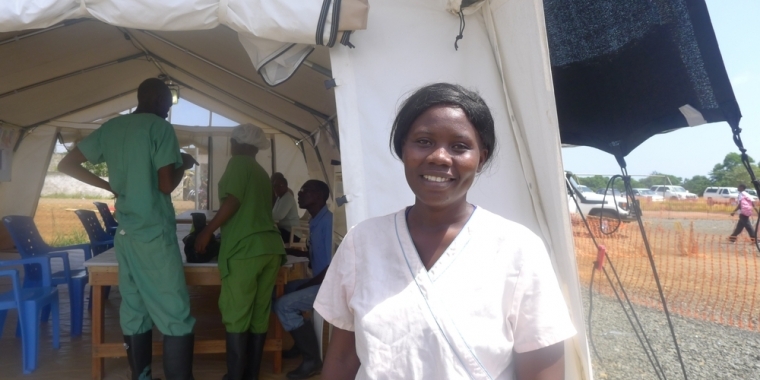 Salome Karwah thought her life was over when she tested positive for Ebola. But after recovering at the Elwa 3 Doctors Without Borders/Médecins Sans Frontières (MSF) Ebola treatment center in Monrovia, Liberia, she began working as a mental health counselor there, helping others to fight the virus. Here she tells her story. Salome Karwah, Ebola survivor turned caretaker with MSF in Liberia. “It all started with a severe headache and a fever. Then, later, I began to vomit and I got diarrhea. My father was sick and my mother too. My niece, my fiancé, and my sister had all fallen sick. We all felt helpless. It was my uncle who first got the virus in our family. He contracted it from a woman he helped bring to hospital. He got sick and called our father for help, and our father went to him to bring him to a hospital for treatment. A few days after our father came back, he too got sick. We all cared for him and got infected too. On August 21, I and my whole family made our way to MSF’s Ebola treatment center in Monrovia. When we arrived at the treatment unit, the nurses took my mother and me to the same tent. My fiancé, my sister, my father, and my niece were taken to separate tents. My sister was pregnant and had a miscarriage. They took our blood and we waited for them to announce the results. After the lab test, I was confirmed positive. I thought that was the end of my world. I was afraid, because we had heard people say that if you catch Ebola, you die. The rest of my family also tested positive for the virus. After a few days in the isolation ward, my condition became worse. My mother was also fighting for her life. She was in a terrible state. At that point, the nurses made the decision to move me to another tent. By then, I barely understood what was going on around me. I was unconscious. I was helpless. The nurses had to bathe me, change my clothes, and feed me. I was vomiting constantly and I was very weak. I was feeling severe pains inside my body. The feeling was overpowering. Ebola is like a sickness from a different planet. It comes with so much pain. It causes so much pain that you can feel it in your bones. I’d never felt pain like this in my lifetime. My mother and father died while I was battling for my life. I didn’t know they were dead. It was only one week later, when I had started recovering, that the nurses told me that they had passed away. I was sad, but I had to accept that it had happened. I was shocked that I had lost both my parents. But god spared my life from the disease, as well as the lives of my sister, my niece, and my fiancé. Though I am sad at the death of my parents, I’m happy to be alive. God could not have allowed the entire family to perish. He kept us alive for a purpose. I am grateful to the workers here for their care. They are very nice people. They really care for their patients. The care, the medication, and encouragement can help a patient to survive. When you’re sick with Ebola, you always have to encourage yourself: take your medication; drink enough fluids—whether it’s oral rehydration solution or water or juices—but don’t keep your system empty. Even if they bring you food and you don’t have any appetite to eat, just eat the soup. After 18 days in the treatment center, the nurses came in one morning and took my blood and carried it to the laboratory for testing. Later that evening, at around 5:00PM, I saw them return. They came and announced to me that I was ready to go home because I had tested negative. Then I felt that my life had begun again. I went home with joy, despite having lost my parents. But, to my surprise, I saw one of the ladies in the group come to my house to ask me to take her mother to the treatment center because she was sick with Ebola. I did it, and I felt happy that at least she knows now that someone cannot go to a supermarket to buy Ebola. It’s a disease that anyone—any family—can get. If someone has Ebola, it isn’t good to stigmatize them, because you don’t know who is next in line to contract the virus. Now, I am back at the treatment center, helping people who are suffering from the virus to recover. I am working as a mental health counselor. I find pleasure in helping people, and that is what brought me here. My efforts here may help other people to survive. When I am on a shift, I counsel my patients; I talk to them and I encourage them. If a patient doesn’t want to eat, I encourage them to eat. If they are weak and are unable to bathe on their own, I help to bathe them. I help them with all my might because I understand the experience—I’ve been through the very same thing. I feel happy in my new role. I treat my patients as if they are my children. I talk to them about my own experiences. I tell them my story to inspire them and to let them know that they too can survive. This is important, and I think it will help them. This entry was posted in Daughter, Father, Inspirational, Mother, Women and tagged caregiver, Doctors without borders, Ebola, fighter, herstory, humanitarian, inspiration, Inspired by my mom, inspiring story, Liberia, Médecins Sans Frontières, MSF, nurse, survivor. Bookmark the permalink.